Rector of the Slovak University of Technology in Bratislava invites applications for postdoctoral research positions to work on the research projects. V rámci projektu „Image In Life“ zameraného na porozumenie správaniu buniek pri vývoji zložitých živých organizmov prostredníctvom analýzy 4D mikroskopického obrazu sa otvára 14 doktorandských pozícií v šiestich európskych krajinách. European Alliance for Innovation (EAI) organizes on 22-24 November 2016 its 2nd Annual Smart City 360° Summit in Bratislava to provide a platform for professional collaboration, presentation of scientific output and to link research with practice. SmartCity 360 Summit was held at the premises of the Slovak University of Technology (STU) in Bratislava and at the Radisson Blu Carlton Hotel from 13th to 16th October 2015. SMART CITY 360 Summit brings together number of researchers, industry and governmental organizations, addressing the challenges of future cities and citizens. Expression of Interest for hosting Marie Sklodowska – Curie fellows at Slovak University of Technology in Bratislava - Institute of Computer Systems and Networks, Faculty of Informatics and Information Technologies, Slovak University of Technology in Bratislava, Ing. Tomas Kovacik, PhD. Expression of Interest for hosting Marie Sklodowska – Curie fellows at Slovak University of Technology in Bratislava - Institute of Nuclear and Physical Engineering, Faculty of Electrical Engineering and Information Technology, Prof. Vladimir Slugen, DSc. STU became a member of „TREC-Danube“ - Transnational Renewable Energy Cluster. 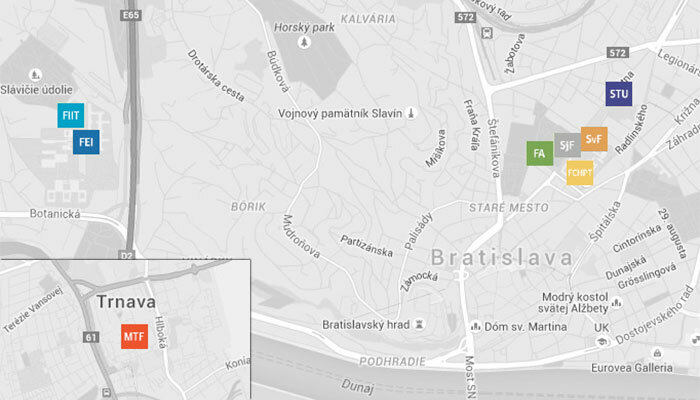 Will be held on September 9, 2014 in Bratislava, university hall of Dionýz Ilkovič STU, Mýtna 36 St.
STU invites applications for a postdoctoral research positions.